New York: A Documentary Film is an eight-part, 17½ hour, American documentary film on the history of New York City. It was directed by Ric Burns and originally aired in the U.S. on PBS. The film was a co-production of Thirteen New York and WGBH Boston. The much anticipated final two episodes of the acclaimed, Emmy winning series, “New York: A Documentary Film” are narrated by David Ogden Stiers. Episodes six and seven of the series — directed by acclaimed filmmaker Ric Burns — examine the history of this great city and explore the forces that have shaped it from the Great Depression down to today. The series was written by Burns and James Sanders. 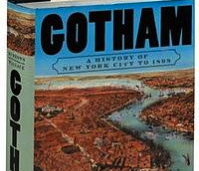 Several noted New York City historians, including Mike Wallace, Kenneth T. Jackson, David Levering Lewis and Robert Caro participated in the making of the series as consultants, and appeared on camera. It was narrated by David Ogden Stiers. Other notable figures who appeared in the series include Rudolph Giuliani (then the mayor of New York City), former mayor Ed Koch, former New York governor Mario Cuomo, former U.S. Senator Daniel Patrick Moynihan, poet Allen Ginsberg, novelists Alfred Kazin and Brendan Gill, director Martin Scorsese, journalist Pete Hamill, former Congresswoman Bella Abzug, historian Niall Ferguson, and billionaire Donald Trump. 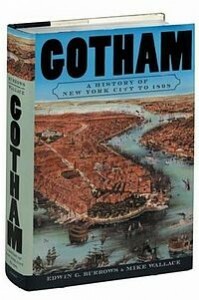 Gotham: A History of New York City to 1898 is a non-fiction book by historians Edwin G. Burrows and Mike Wallace. Based on over twenty years of research by Burrows and Wallace, it was published in 1998 by Oxford University Press and won the 1999 Pulitzer Prize for History. Wallace is currently working on the second volume, which will cover New York City history through World War II. “Gotham” as a term for New York City was coined by Washington Irving in an 1807 November issue of his literary magazine, Salmagundi, based on the legends of the English village of Gotham, whose inhabitants are known for their folly.